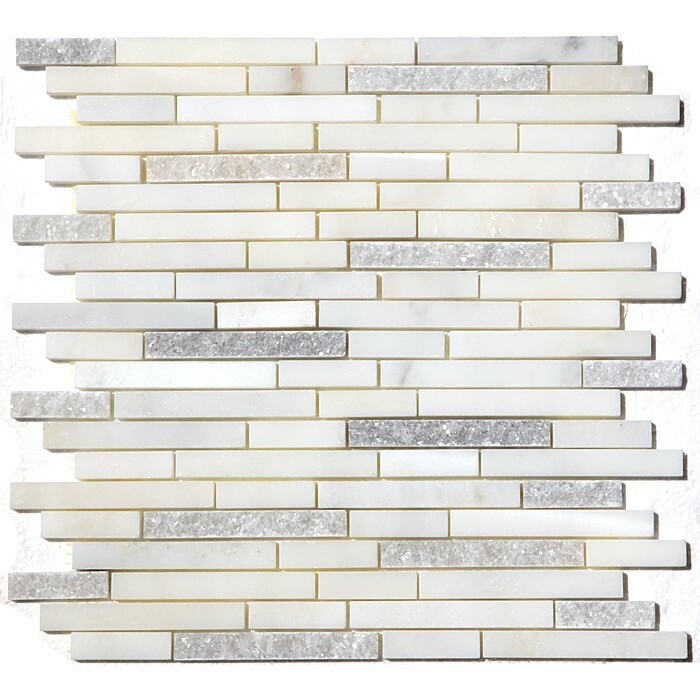 Carrara White Duo Interlocking 12x12 Mosaic. SOLD BY BOX OF 10 TILES / 10 SQ FT.
Carrara White Duo Polished and Splitface Pattern mosaic tiles are backed by mesh. Carrara White marble is one of the iconic luxury Italian marbles featuring shades of white and gray with stunning charisma. Projects recommended for these beautiful tiles include flooring and walls. BRICK SIZE 2" X 5/8" & 2" X 3-7/8"
FINISH - 30% Split-face, 70% Polished. This is my third order of this tile. It looked amazing on a Column in my kitchen so we decided to use it again on the front of our wall unit. It is beautiful. Was shipped fast! Will be using Wall and tile again for all our tile needs. Pictures to follow as soon as we are done. my order for a sample was completed and shipped promptly and the company sent receipts via email. My actual order for tile (#30000009) was also handled efficiently. The only downside was that a couple of tile were broken, in spite of being well packaged. Alex, the CSR, was prompt in sending the replacement "FREE". Lesson learnt to order few extra - Cannot trust the freight carriers UPS :) Wish I can give more than 5 stars for customer service.